The evergreen perennial dark green foliage is highlighted with silvery-white vertical variegation. The evergreen perennial dark green foliage is highlighted with silvery-white, yellow or orange vertical variegation. 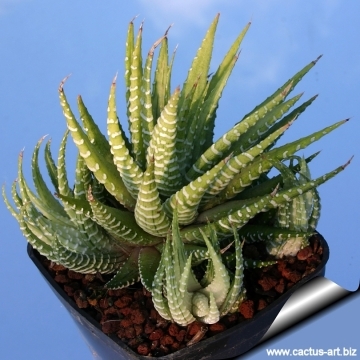 It is highly variable and offsets profusely with several colours and degree of variegation also in the same plant. Description: Stemless clustering perennial-succulent, with evergreen perennial dark green, narrow foliage that eventually form large clumps. There are several variegated cultivars that differs from the standard species for having silvery-white, yellow, pink or orange vertical variegation. 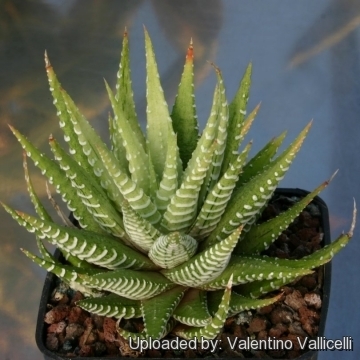 The more common variegated form (H. attenuata "albovariegata") has cream to silvery white strips. Rosettes: 6-12cm diameter, 6-13(25) cm tall, heavily clumping. Bloom time: Can be ever blooming if you snip off each bloom when it dies. 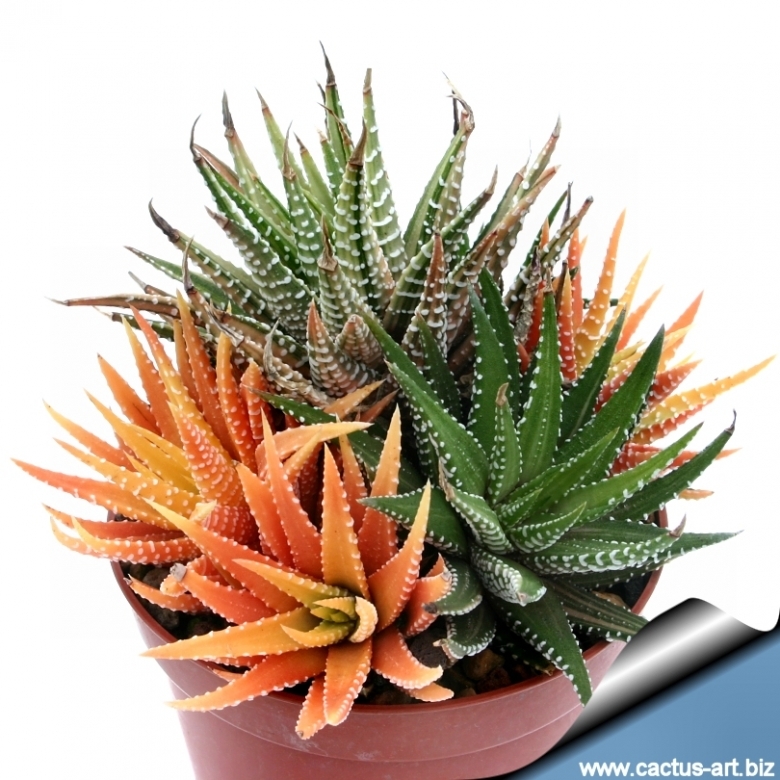 Notes: Not all, but, occasionally the variegated plants will revert to solid colored foliage. Some varieties more than others but most of them will revert. The plants that are sports tend to be the worst. Sports are branches that spontaneous changed to a variegated leaf. Because genetically the change is only skin deep they can change back. As you look at variegated plants you often see branches that have reverted to solid green and others that have continued the change to solid white, yellow or orange. The branches that have reverted green tend to overtake the entire plant. If you think about it the reason is obvious. Green means chlorophyll. yellow or white means little to no chlorophyll. The branches with lots of chlorophyll have more energy and grow more vigorously. If you have variegated plants that have green branches mixed in with the variegated branches you need to cut ALL the green branches back to where all the branches left go to variegated foliage. You need to be ruthless about this. If some of the branches are all yellow or white you can cut those back also, but because of their lack of chlorophyll they don't tend to take over. The coloured shoots looks great but they are much slower growing. More chlorophyll means more growth. Cultivation and Propagation: Very easy to grow and common. Need regular water but do not water again until dry. Also, it is a species that is dormant in the winter and require very little water (maybe even none) during the cold months. Sun Exposure: Requires light shade to bright light (protect from strong midday sun). Can be sunburned if moved from shade/greenhouse into full sun. The amount of sunlight it can withstand without scorching depends upon the how hot it becomes in the summer in the locale in which it is planted. It will have more colour if it receives more light. During the spring it may be able to take full sun until the heat arrives at the end of spring. In an area that has hot afternoon sun, it may be able to take full morning sun, but requires afternoon shade or afternoon light shade.